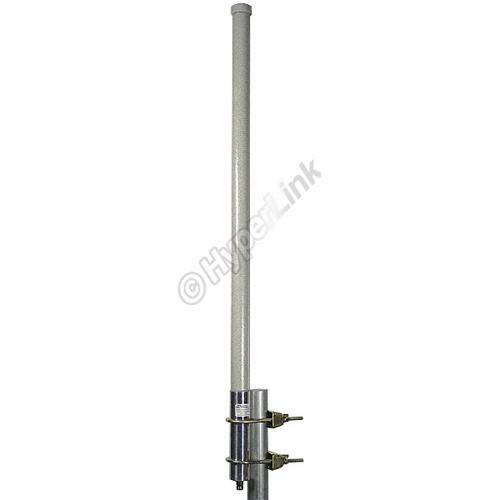 The HyperGainÂ® HG2415U-PRO is a Profession Grade Omni-Directional antenna that can be used for Commercial installations. The antenna features high gain and superior VSWR. The unit is optimized for the 2.4GHz ISM band. A collinear Omni-Directional antenna that utilizes a center fed Collinear Dipole array that offers superior performance over the traditional bottom fed collinear designs. A center fed collinear has radiating elements that are more uniformly fed with signals of the proper amplitude and phase. In a bottom fed design, the signals that reach the upper elements have undergone significant amplitude and phase degradation. In most cases, the upper elements of an end fed design contribute little to the antennas final composite gain and pattern. In the HyperGainÂ® HG2415U-PRO, an internal copper hard-line provides a low loss path to the antenna's central splitting and phasing component. The brass radiating elements of the HG2415U-PRO utilize an air dielectric for lowest loss and superior radiating efficiency. The design is factory tuned for superior performance.